The New Factory of Ming Wei The old factory ( 1st Factory: 1,500m square) of Ming Wei Company located at central Taiwan has established for 22 years. Due to the production development and requirement, Ming Wei Company rented another factory ( 2nd Factory: 2,650m square) in which the containers store since 10 years ago. Because the international orders of Ming Wei Company are becoming more and more, our work spaces are insufficient. These two factories accompanying Ming Wei Company receive various international orders from 60 countries or so. A lot of production is planed, designed, installed, tested, and exported here. The President, Liu Ming Chung, think that we have to focus on customer service and expand operating spaces so that he planed to hunt and to build new factory since five years ago. Therefore, it will be the end half of 2008 when the new factory area of Ming Wei Company with technology and humanity will be finished. 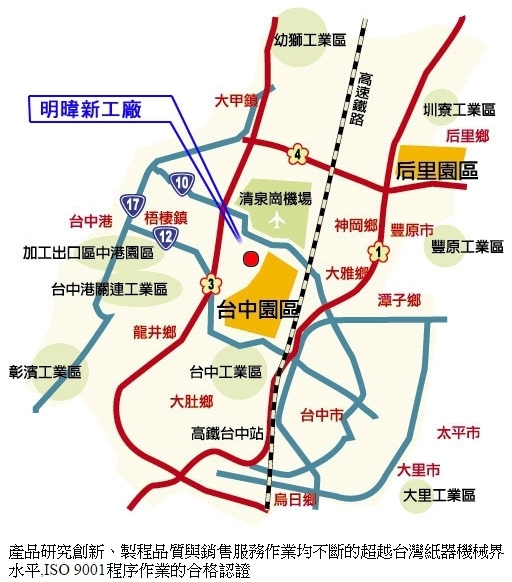 The Location of New Factory Area: The new factory area is near Taichung international airport, freeway, Taichung Science-based Industrial Park (such as Taiwan Semi-conductor Manufacturing Company, AU Optronics Corp., Mobile Electronics Solution and so on), Taichung seaport, Taiwan High Speed Rail (which connects the main traffic system in northern and southern Taiwan). After the new factory area will be founded, it will draw many talented people owning high technology background. Due to Taichung international airport, it will be convenient for foreign customers to visit Ming Wei Company in Taiwan. The wide Taichung seaport area, having perfect life function, provides a very good career and recreation environment. 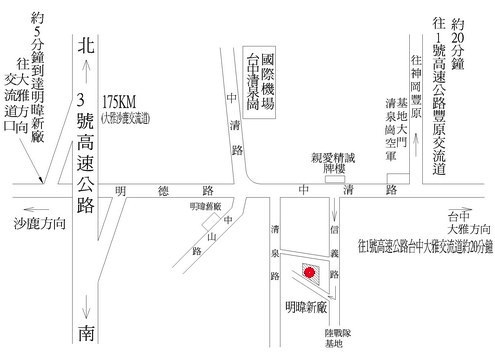 The new factory area of Ming Wei Company will be located in the area near the Dadu mountain and surrounded by Taichung tourist resorts, and it is away from the noisy Tacichung downtown. During working, the staff in Ming Wei Company is allowed to enjoy a wonderful environment. Arranging of New Factory Area The area of new factories is 13,000m square, including 60 percent of factories plus offices and 40 percent gardens, has everyone enjoy wonderful environment. 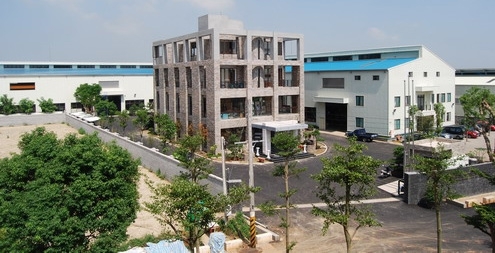 In the new factory area, there is one production factory which is divided into three main areas. One of areas is the producing and assembling printers area, and six printers are produced at the same time. Others are corrugated cardboard making lines, plus material management offices in which 30-40 staff deal with business. A three-floor-high office building includes the management offices (CEO, sales, R&D, financial and production management), and equips with 20-30 staff and computer software equipment on the first and second floor; therefore, meeting rooms on the third floor feature modern TV and audio devices.